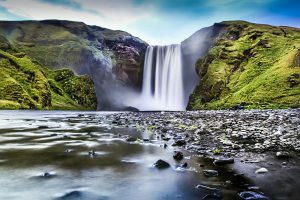 Join this tour along Iceland’s south coast to discover its stunning glaciers, lava fields, volcanoes, strong rivers and waterfalls. You will also see an amazing black beach. Iceland is a place where weather can change every 5 minutes. In case of a heavy rain or a strong wind, the places of interest can be reduced. The decision is up to drivers responsibility. 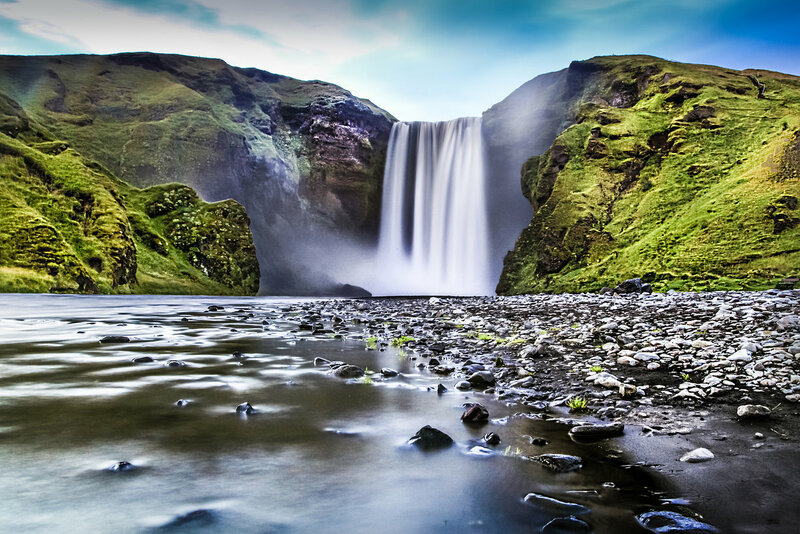 60 meters high waterfall in a lovely location, sourrounded by cliffs and green slopes. Who wants can walk a footpath leads behind the waterfall. Just take some jacket ..its a bit shower. 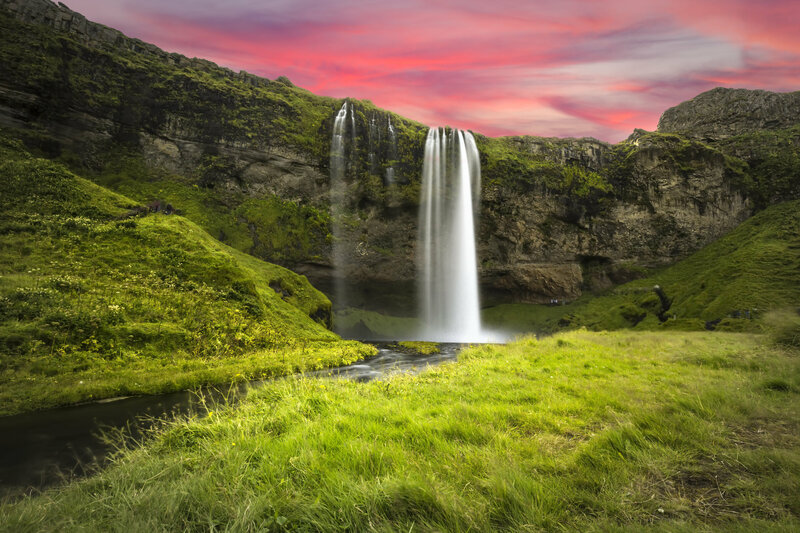 Souce of waterfall´s water is glacier everybody probably heard about – Eyjafjallajökull. This volcano erupt last time on 14th April 2010 when volcanic eruption threw ash several kilometers up in the atmosphere. This led to stop air traffic in most of Europe. The effect of the eruption turned out to be more widespread then even before in modern history. Because of the ash cloud aproximetlz 107.000 flights were canceled during an 8 day period and 10 million passengers were affected. The Ejafjoll volcanic system is stratovolcano with developed 2,5 km wide caldera. Four eruptions are known in historical times, in 920, 1612, 1821-22 and 2010. Jökulhlaups (glacier outburst floods), created by lava melted snow, destroyed many parts of the road n.1 and long time after volcano got to be silent again, you could see how volcanic ash covered usually green meadows along the coastline. Eyafjallajokull and Mýrd. ls, following river with small or bigger 23 falls, via lava fields full of sulfur steams, icecap of galcier, deep valleys of god Thor etc. Waterfall itself is 60m high and 25m wide. According to legend, the first Viking settler in the area, ﬁrasi ﬁórólfsson, buried a treasure in a cave behind the waterfall. On fine days, when the sun is shining, people say that his gold is glittering through the water. Many have tried to find the chest and once a young man succeeded. He tied a rope to its ring and pulled. He only retrieved the ring, which was later used for the church door at Skogar. Now it is one of the prides of the Skófar museum. Road n.215 Reynishverfisvegur runs down to Reynisfjara beach. Reynir is a farm that dates from the settlement of Iceland. The land was claimed by Reyni-Bjorn from Valdres in Norway. His holdings extended from Kerlingardalsá to Hafursá. The events behind the folk tale of the church-builder of Reynir are said to have a taken place here. The first church at Reynir is mentioned in the ecclesiastical register of 1200. In 1897, the church was moved to the site somewhat farther south. In the local cemetery is buried physician and naturalist Sveinn Pálsson (1762-1840) from Sudur Vík, who was famous for his studies of Icelandic glaciers. According to legend the Reynisdrangar needles were formed when two trolls were trying to drag a three-masted ship to land, but daybreak overtook them before they could reach the safety of the mountain, they turned to stone. 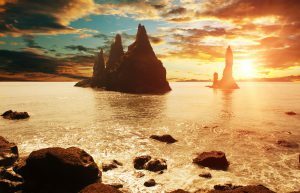 The needled can be seen clearly from the village of Vík or from black beach. They are 66m high. They are named Skessudrangur, Langhamar and Landdragur. We will walk for a while along black beach under basalt clifs. The cliffs are home to countless puffins, kittiwake and fulmar, you can see them hunting for fishes taking off from nests.